In previous years numerous companies from the dental industry have been portrayed in our Global Player series. Naturally, several renowned companies worldwide are still missing in this series, but over the past decades it has provided a very good overview of the most wellknown manufacturers. We can now fill in one large gap. Hager & Meisinger, in fact one of the world-famous dental companies and one of the market leaders in rotary instruments - has as yet not been the subject of a report. 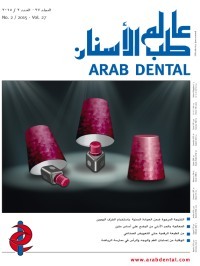 We are extremely pleased that we can make up for this in this issue and present the manufacturer here at last, who says about itself: "We regard the Arabian dental world as a motor for bringing innovations quickly to the user." Dental injuries are the most frequently occurring orofacial injuries in sports activities. Further, the most serious and life-threatening consequence of orofacial trauma is concussion. Not only do mouthguards protect teeth, but they also protect the head from blows to the jaw that can result in concussions and unconsciousness. This article reviews the different types of sport-caused injuries, as well as their management and prevention. It also highlights the indications and benefits of mouthguard use, and the types of mouthguards. Regensburger, M. / Wagner, B.